Urban Initiatives – The Cubs Can’t Wait for Summer Camp! The Cubs Can’t Wait for Summer Camp! This year, the Cubs on the Move Fitness Trolley just couldn’t wait until July to start getting kids active! Teamed up for a second year with Urban Initiatives, the Fitness Trolley traveled to 4 Chicago public schools for “Preseason Training Camp,” so that kids and Cubs could get ready for summer. Urban Initiatives hosted weekly preseason camp at Daley, Palmer, Fulton and Beidler schools to discuss physical health, the value of teamwork, and (most importantly) to brush up on their sports skills in anticipation of an active summer! At Palmer, Ms. Robinson’s 3rd grade practiced proper batting and base running. Many of the students held a bat for the first time ever! Afterwards, they snacked on apples in the trolley and discussed nutrition with Cubs pitchers Neil Ramirez and Wesley Wright. “Is fruit punch healthy?” asked Alex. The class determined that, although it claims to be fruit, they can only know if juice is healthy if it says “100% juice” on the label. At Beidler and Fulton, everyone’s favorite visitor was Clark, the Cubs’ furry mascot! 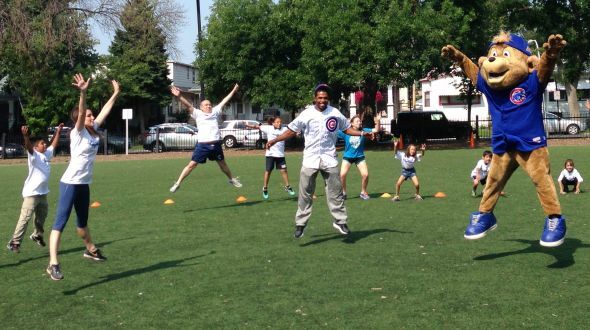 His antics made everyone laugh, and kids loved having him pitch to them while they practiced base running. At Daley, students enjoyed discussing teamwork. It turns out that we aren’t just on a team when we play sports…our classroom is a team, as well as our family and our community! Thanks, Cubs! We’re looking forward to staying fit this summer and we’ll see you when the trolley rolls up!